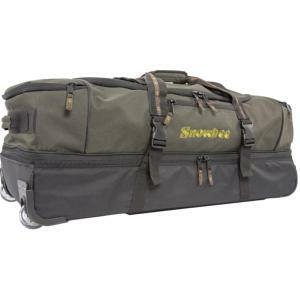 Snowbee XS Travel Bag, for travellers to any fishing destination around the world, this bag has been designed and built to withstand all the rigours of international travel & rough baggage handling. When designing this model, many simple but innovative features have been incorporated to provide a most flexible great looking bag, incorporating the most essential travel requirements. 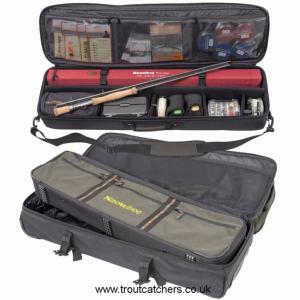 Snowbee XS Travel Bag + Stowaway Case combo - Special Price Save over 10% on single troutcatcher prices and 17% On RRPs. 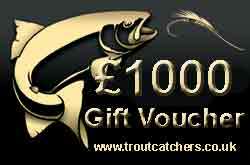 Turralls Bamboo fly box & 100 award winning River Turrall flies offers a balanced choice for river fly fishing. 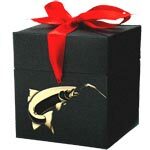 The complete selection of 100 fishing flies are presented in Turralls mellow split cane fly box of which is a larger version of Turralls classic bamboo box Fly box. The fly box is approximately 195mm x 105mm x 35mm. Turralls Bamboo fly box & 100 award winning Stillwater Turrall flies offers a balanced choice for stillwater fly fishing. 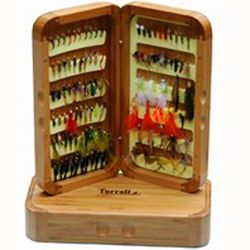 The complete selection of 100 fishing flies are presented in Turralls mellow split cane fly box of which is a larger version of Turralls classic bamboo box Fly box. The fly box is approximately 195mm x 105mm x 35mm. Incorporating the very latest thinking in Float Tube design, the twin-tube 'V-Boat' style, has the tubes swept up to form a bow, providing less resistance and far easier passage through the water, whilst maintaining great stability. 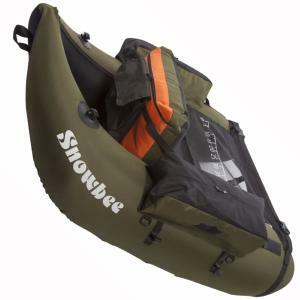 Weighing in at just 4.5kgs (10lbs), Snowbees Classic Float Tube can be easily 'back-packed' with the shoulder straps provided, for effortless hiking up to hill lochs and reservoirs. Special Order - Ordered on request, normally dispatched 3 - 5 working days. 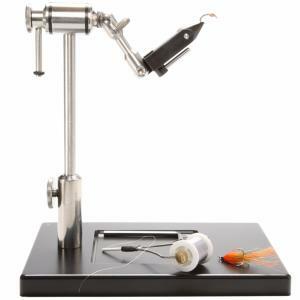 Stonfo Morsetto Kaiman Vice, a high technology fly tying vise for a fast hook changing, simply squeeze the lever and then drop the hook into the jaw for the hook to be held solid in the vice. The Morsetto Kaiman vice's hardened steel jaw is designed to cover hooks ranging from tiny #28 to mighty #5/0 saltwater hooks, with no adjustment. Other features include, lever with anatomic handle, 360 rotary action with dual precision ball bearings, double diameter hand wheel, adjustable rotary tension, locking position to 0, adjustable tying angle, adjustable height. The lever can be set up for both left and right handed use. 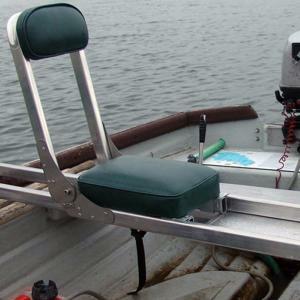 Supplied with pedestal base (5.5x3 inches) (total weight of vice 3lb 14oz), spring material clip, Allen keys and instruction manual.Stonfo Morsetto Kaiman Vice featured in trout fisherman issue 451 (Nov 2013) "An excellent lever vice, engineered from quality materials"Note: Special Order. Usually available 3 to 5 days. 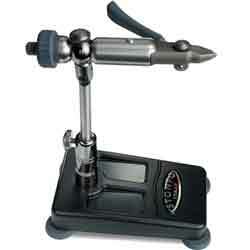 Stonfo Morsetto Tube fly Vice, a high technological tube fly vise designed to work with a large range of tube sizes. The Morsetto Tube fly Vise's shaft is in-line full rotary thanks to dual precision ball bearings. The ergonomic shape and the double diameter hand wheel add to its functionality. The tube fly vice includes 3 accurately machined graduated pins and 2 cylindrical pins for tying on all different tubes. 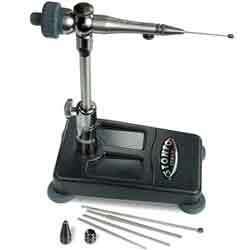 Other features include: adjustable tying angle, adjustable rotary tension, locking position to 0, adjustable height. Supplied with pedestal base, spring material clip, Allen key and instruction manual.Note: Special Order. Usually available 3 to 5 days. 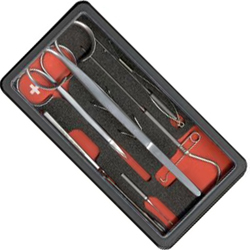 Petitjean Fly Tying Tool Kit #1 A beautifully engineered tool set. Comes in its own case with cut foam to hold everything in place. Snowbee - Waldron Vice - Pedestal Model. The Snowbee-Waldron Vice offers the advanced fly tier faultless engineering precision coupled with a silky smooth operation. The vice's appeal is its simplicity. Superbly CNC engineered to tolerances of less than 0.01mm using 303 grade Stainless Steel, aluminium and CR12 tool steel for the jaws, hardened to Rockwell C 58. The main head axle runs on two sealed stainless steel ball-race bearings. Tension for the 360° rotating head is by means of a tension screw at the rear, operating on two delrin washers. The vice jaws are joined to the main head by means of a simple link-arm. Two Allen screws allow setting up of the jaws for total rotational symmetry about the center line, irrespective of the hook gape. The precision jaws feature two precisely milled grooves to allow different sized hooks to be held securely - from as small as #28's right up to large single Salmon irons and the largest saltwater fly hooks available. All Vices come with a purpose designed carrying bag, Allen key adjuster tools, full instructions and a 5yr Manufacturers Warranty. Snowbee Nivalis Down Jacket, a new high-tech Nivalis Down jacket features a totally unique construction technique – an internal & external 3-layer laminated fabric, using hidden, internal stitching, to form the down pockets. This means there is no external stitch-line, to allow water to penetrate. EFTTEX (European Fishing Tackle Trade Association) 'Best New Product 2018 Award' & 'Tackle Tester Choice trout fisherman' Award. 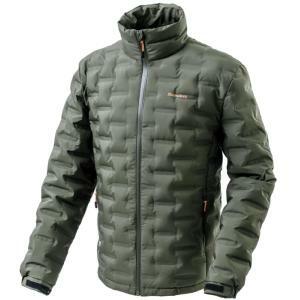 Snowbee Nivalis Jacket - Collar Version, uses the same technology as the original Snowbee Nivalis Down Jacket. 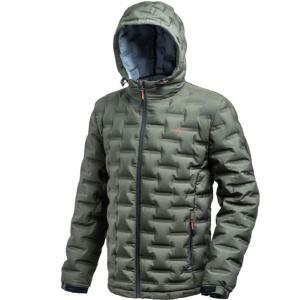 A general purpose leisure jacket where a hood is not required. The Nivalis Collar Version is equally suitable as a mid-layer garment under a waterproof outer shell which has a hood built in. 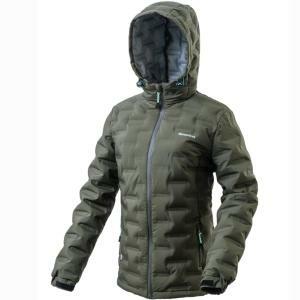 Snowbee Nivalis Jacket - Ladies Version, uses the same technology as the original mens Snowbee Nivalis Down Jacket, but styled by Snowbee designers specifically for ladies. A more flattering waisted cut providing a snug fit coupled with freedom of movement. 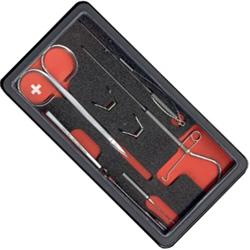 Veniard Paramount II Fly Tyers Kit - Brand New Updated Kit originating from the Famous previous Paramount Fly Tying Kit. 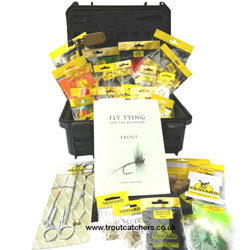 Includes all the latest fly materials and tools, plus all those traditional must haves! 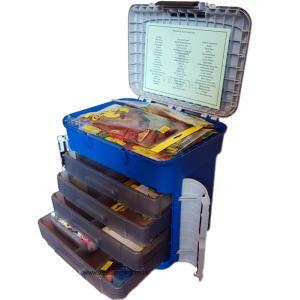 The enormous range includes a good quality side sprung lever fly vice and a large caddy, all packed away in a sturdy plastic container, enabling the user to tie flies for all types of fish. An absolute bargain, purchasing all these items separately would cost you a lot more! Veniard Pinnacle Fly Tiers Kit, New & Improved - a comprehensive fly tying kit with enough fly materials & fly tools to tie 100's of different fly patterns. The Veniard Pinnacle Fly Tiers Kit comes in a superb plastic box (upgraded) with a deep top storage section and 4 sectioned trays. Approx Size: 42cm width x 30cm depth x 40cm height. FREE UK SHIPPING - Overseas contact us to quote you a shipping price. Next Day Available.